Finished W's Mitts. They are enormous !! Well were on me. 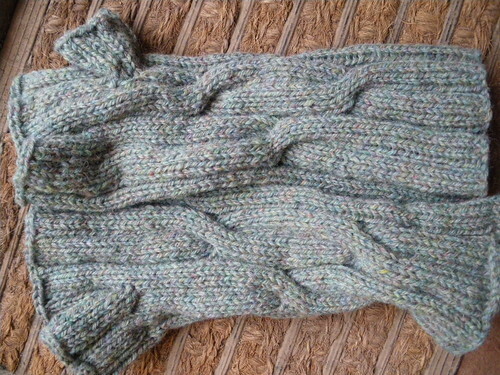 On W though they fitted beautifully – had to cast on 55 stitches instead of the 44, and also added extra rows to make them gauntlets rather than just wrist warmers. 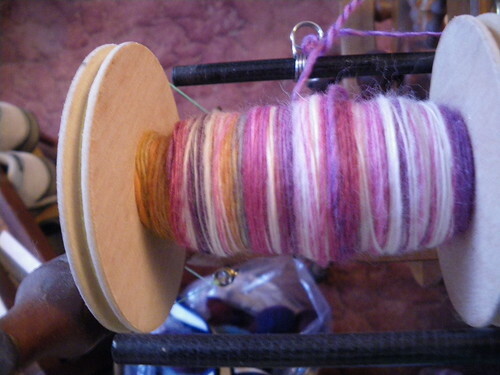 I am spinning up the fibre from Fibreholics - Round 9 which has proved a very pleasant experience, and I am back using my traveller – oh how I have missed you. The five in here are from Knitcave, Sara’s Texture Crafts, Thyalicine, Heart Exposed and Lala Bear (wouldn’t swear to this, as I might well have got the labels the wrong way around – dropped them three times whilst sorting myself out). I have been a supporter and purchaser since Round 1 – a couple of years ago now, and whilst overall I have been inspired by the packs, and applaud the concept, I have been disappointed that the general quality and selection offered has declined during this year in particular (February was the last really good one) and with my selection in Round 8 had considered not continuing. It seems to me that as the whole project has organically grown, with more and more people supplying (and some of the tried and tested dropping out) the quality of the samples can only be described – at best – variable. It feels sometimes as if there is a whole genre of home/amateur “indi-dyers” jumping on the handcrafted “bandwagon”. With the two very felted bumps that I have on my desk in front of me now, I am sad that I cannot love them, despite their glorious colour and labelling. I query the decision of quality control to include them. It feels that as they have only qualified by being labelled hand-dyed, and for that reason alone I should fall in love with the inferior quality fibre. Honestly, these samples are not really the kind of thing you would want to spin, and would struggle to unravel to use as felt – so I am going to chuck them, which makes the pack a very expensive pack. 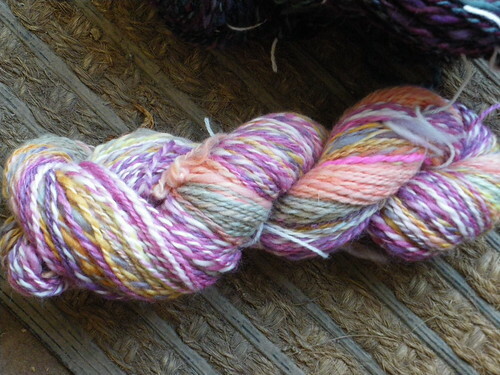 I have only had one of the yarn packs during the series and didn’t bother again, as the spinning contained within of three of the samples was of a very poor quality, no matter how kindly I tried to look upon them. I am not a yarn snob though, and am happy to try any beautifully prepared and finished samples, just not hastily produced and of poor quality. What I do like though is when the packs take me out of my comfort zone and i am invited to try blends that I would not otherwise look at, such as camel, merino and silk waste. 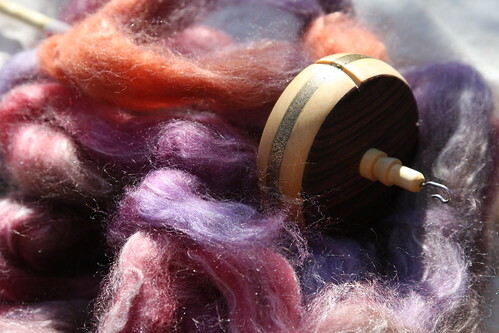 These are perfect for spindle spinning special items, and as I know a lot of the more established and exciting indi-dyers, it is lovely to find something from them to try as a special treat. So there are some gems, and I hope there are some more in the future.